There is a request, might even be a plea at this stage, to hand write an answer to the following question. What is the best piece of advice anyone has ever given you? and submit it to the artist who is embarking on a rather interesting installation piece for an exhibition in Scotland in March. The details of what exactly is being asked for and the deadline for submissions can be found on The Society of Scottish Artists website. I understand the deadline for submissions has been extended to the 24th January and that might be extended again. Anyway this question has had me thinking back and forth remembering all sorts of advice I have been given over the years both pre and post becoming a monk. And the winning advice? ….comes from a former head of our order, Rev. Master Daizui who said many times to many people, Never give up on anybody. 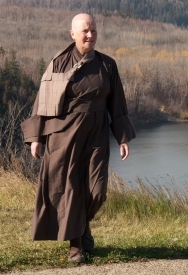 A close second comes from another monastic, Remember, everybody has a good heart for you. Given the course of human connections which can become strained these two pieces of advice have stood me in good stead. Although I rarely have had need to call on them though. I admire the first one. But the second one isn’t true, is it? Everyone has a good heart for you is (perhaps) another way of looking at Never give up on anybody. Just a thought. At the time I was given the ‘good heart’ advice it left a deep impression. A wise monk told me to train “as though my hair were on fire”. Never forgotten. Oh dear, that one can put somebody in a ‘fizz’ for life. Glad it worked for you though, well at least you didn’t forget it.